Hein de Haas: Visas reduce immigration ... and return! Visas reduce immigration ... and return! The effectiveness of immigration policies is highly contested. While politicians often claim that visas and border controls are necessary to prevent uncontrolled immigration, many researchers argue that immigration restrictions fail to stop migration as they do not affect the fundamental causes of migration, such as income gaps, labour demand in destination countries, conflict, and paradoxically, development in origin countries. Other researchers have argued that immigration restrictions do significantly reduce immigration. Yet such discussions are limited as they focus on how immigration controls affect inflows and ignore how they affect return. Politicians are generally concerned with net migration – the number of immigrants minus the number of return migrants from one country, which determines the number of migrants who stay. Faced with the large-scale settlement of low-skilled immigrants, politicians have long been interested in stimulating return migration. This has recently led to much talk about circular migration as the ideal way to marry the interests of migrant workers to gain access to legal migration opportunities and governments of destination countries who often feel public pressure to reduce permanent immigration. The pertinent question is therefore how restrictions affect the circulation of migrants. This has remained largely ignored by research to date. A new research paper I have written with my colleague Mathias Czaika at the International Migration Institute, I have just published a research paper that looks at this important issue. This is part of the DEMIG (Determinants of International Migration) project, which has received funding from the European Research Council and the Oxford Martin School. To study the effect of immigration policies on patterns of circulation, we used two new databases DEMIG compiled over the past four years. The DEMIG C2C database tracks country-to-country migration flows between 38 destination countries and a worldwide selection of origin countries. The DEMIG VISA database details travel visa requirements for every country from 1973-2010. In the paper, we treat visa requirements as an important instrument used by governments to prevent the unlimited immigration of people from 'undesired' countries. 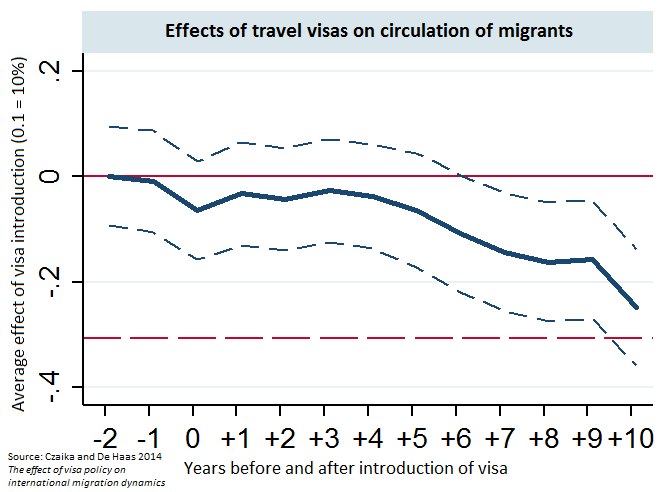 Our statistical estimates show that travel visa requirements significantly decrease inflows (estimated at 67 percent on average) but that this effect is undermined by also decreasing outflows (88 percent on average) of the same migrant groups. We estimated that visa requirements reduce overall circulation by 75 percent on average. Although the real effects vary across countries, the results are statistically significant and provide evidence that immigration restrictions interrupt circularity. Importantly, our analysis also shows that visas severely reduce the responsiveness of migration to economic fluctuations in destination and origin societies. This is easy to understand. If migration is free, as is the case between EU countries or US states, people face fewer obstacles to packing their suitcases and moving in search of better opportunities. They will however, also decide to return more easily if they loose their job or if opportunities back home improve. For instance, many Polish migrants in the UK have returned with the rapid improvement of economic conditions in Poland. If you have invested a lot of effort and money in securing a visa and work permit, it is less likely that you will return if you encounter problems. Immigration restrictions makes returning more risky – if the situation back home is not how you imagined there is a risk of not being able to migrate again. So, what we often see is migrants staying put even in economic crisis and choosing to reunify their families, which partly explains why legal migration continues over formally closed borders. The irony seems that policies that officially aim to reduce immigration and stimulate the return of 'less desired' low-skilled migrants often have the opposite effect of interrupting circularity, increasing family migration, and encouraging permanent settlement. Very interesting! Thanks also for sharing the research paper. Very helpful to understand the effect of visa policies. Thank you for sharing. Immigration law is constantly changing. The best immigration lawyer is one who keeps up with this evolving field of law and knows how best to use the law to protect you when it come to legal proceedings. Really awesome article to read,Thanks for sharing your views on reduction of immigration. It is good to know about how they work. You explain it very nicely. i read your blog really informative . Day by day students facing problems to get visa . now a days its not easy . Interesting this research and facts, would be good if governments would take into account this study!